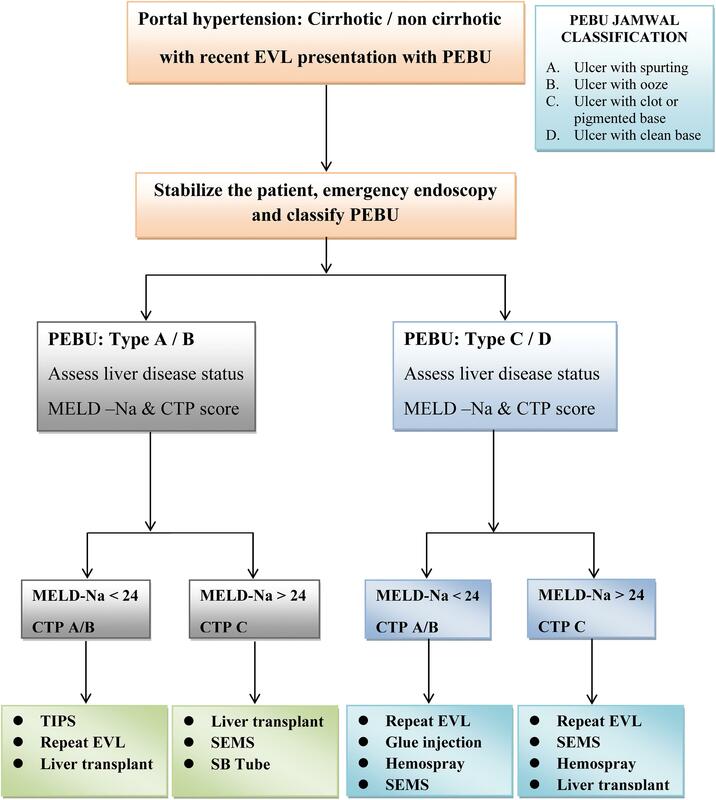 Background and Aims: The management of post-endoscopic variceal ligation (EVL) bleeding ulcers (PEBUs) is currently based on local expertise and patients liver disease status. The present retrospective study investigated associations between the endoscopic morphology of PEBUs and patient outcomes. Methods: Patients underwent EVL (primary or secondary), from January 2015 to January 2018, in two tertiary care hospitals in India (ILBS New Delhi and Dharamshila Narayana New Delhi). Mortality rates were determined at post-EVL day five and week six. PEBUs were typified based on Jamwal & Sarin classification system as follows: A, ulcer with active spurting; B, ulcer with ooze; C, ulcer base with visible vessel or clot; and D, clean or pigmented base. Results: Of 3854 EVL procedures, 141 (3.6%) patients developed PEBU, and 46/141 (32.6%) suffered mortality. Among the former, the PEBU types A, B, C, and D accounted for 17.7, 26.2, 36.3, and 19.8%, respectively. Of those who died, 39.1, 30.4, 21.7, and 8.8% had PEBU types A, B, C, and D. Treatments included transjugular intrahepatic portosystemic shunts (TIPS), esophageal self-expandable metal stent (SEMS), glue and sclerosant injection, Sengstaken-Blakemore tube placement and liver transplant. On univariate analysis, no correlation with hepatic venous pressure gradient, TIPS placement, size of varices, or number of bands was found. The Model for End-Stage Liver Disease (MELD)-sodium score correlated positively with outcome. After adjusting for MELD-sodium score, mortality was best predicted by type-A ulcer (p = 0.024; OR 8.95, CI 1.34–59.72). Conclusions: PEBU occurred in 3.6% of a large EVL cohort. Stratifying patients based on PEBU type can help predict outcomes, independent of the MELD-sodium score. Classifying PEBUs by endoscopic morphology may inform treatment strategies, and warrants further validation. PEBU is of unclear etiology, with varied risk factors and undefined clinical outcomes.5 Remarkably, there is no clinical or endoscopic classification based on the morphology of these lesions (ulcers), or which associates endoscopic appearance with clinical outcomes. This study characterized the various endoscopic morphologies of PEBUs with a classification system, and then investigated each of the 4 defined PEBU types for associations with risk of mortality. The study included an evaluation of a large cohort of patients who underwent EVL with subsequent PEBU, relative to patients who did not experience such bleeding. The study population comprised 141 patients who had undergone EVL at the Institute of Liver and Biliary Sciences and Dharamshila Narayana Hospital, and who had presented from January 2015 until January 2018 with post-EVL bleeding diagnosed as PEBU via endoscopy. Also included in the analysis was a control group of equal size and clinical profile (including severity of liver disease), who had also undergone EVL (primary or secondary) during the same time interval, but did not experience PEBU. Patients who had undergone EVL in another hospital were excluded, to avoid heterogeneous data such as the number of bands deployed, duration of each procedure, expertise of the endoscopist, and clinical parameters at the time of endoscopy. All the included patients were aged 18 to 80 years, able to give valid consent, and had a reliable history with 3 or more months of post-EVL follow-up. Patients with any of the following were excluded: incomplete post-procedural follow up, 5-day, or 6-week records; pregnancy; or critical illness with contraindications for endoscopy, such as severe hemodynamic instability that required Sengstaken-Blakemore (SB) tube placement, or emergency TIPS. All the patients were prescribed PPI’s and oral sucralfate syrup twice a day for 2 weeks. The esophageal varices were classified as small (<5 mm) and large (>5 mm) at the time of the endoscopic examination, both at the time of EVL or during bleeding. The patients undergoing secondary EVL were already on beta blockers, or had begun after bleeding, and the dose was titrated according to heart rate and systolic blood pressure, as standard. Almost all the patients were admitted for observation, and further course of management depended upon the individual’s clinical status: daycare admission, or management in intensive care or high dependency units. Measurement of the hepatic venous pressure gradient (HVPG) of a few patients was conducted as a part of another ongoing study. The liver disease severity was assessed using MELD-Na score and CTP score. It is a retrospective study with patients recruited from both the centers, the primary outcome was five day and the secondary outcome was six week survival after the bleeding episode. The endoscopy procedure was generally conducted either in the endoscopy suite or in the ICU at the bedside, depending upon the patient’s clinical status. All the patients with bleeding underwent endoscopy within 6 to 12 hours of presentation in the emergency room or outpatient clinic. The patient was placed in the left lateral position. If the endoscopy was elective, the patient was under conscious sedation administered by an experienced anesthetist. If the endoscopy was performed in an emergency setting and the patient was hemodynamically stable, actively bleeding, and conscious, a topical sedation was used. However, if the patient was hemodynamically unstable or presenting with Grade II-IV encephalopathy, elective endotracheal intubation was implemented before the endoscopy. The endoscopes used were either an adult gastroscope Olympus GIF-180, Olympus GIF-150, or a single-channel therapeutic gastroscope Olympus GIF-1T160 (Olympus Medical, Tokyo, Japan). The PEBUs were classified based on their endoscopic appearance in descending order as types A, B, C, and D, in accordance with the Jamwal & Sarin classification of PEBU, as follows (Table 1, Figs. 1–4, respectively). 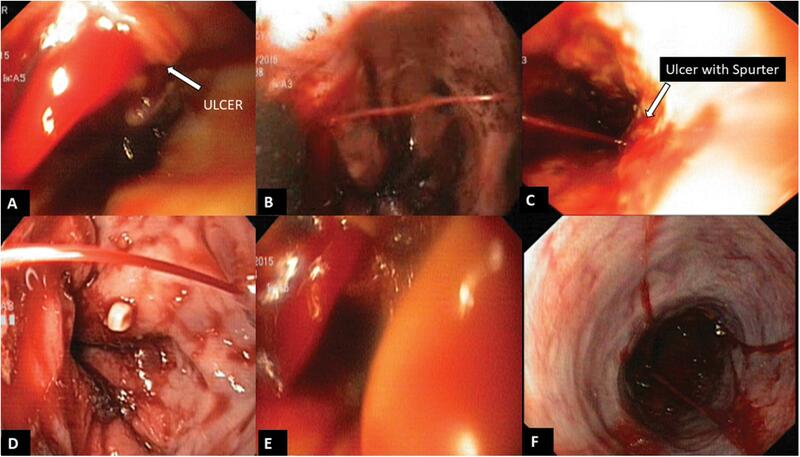 Each type included ulcers with or without EVL bands in situ. In type A, there was active spurting from the ulcer. Type B was characterized as active oozing from the ulcer. In Type C, the ulcer appeared with a pigmented base or a visible clot. The type D PEBU ulcer had a clean base (white or yellow). 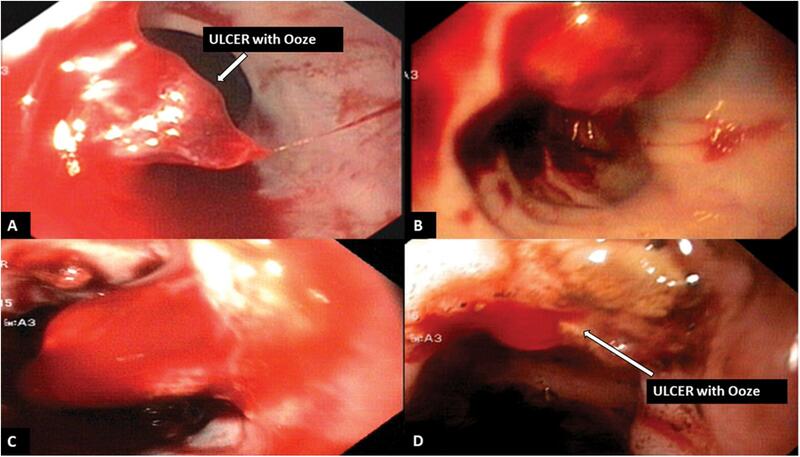 If at the time of endoscopy the patient had more than one type of ulcer, then the higher order was chosen. Fig. 1. Type A ulcer with spurting. (A, B) With EVL bands. (C–F) Without EVL bands. Fig. 2. Type B ulcer with ooze. Bleeding can be noted (A, B) with EVL bands in situ, and (C, D) without EVL bands. Fig. 3. Type C ulcer with visible clots, scab or exudates from the ulcer without any bleeding. Fig. 4. Type D ulcer with pigmented or clear base. The data was analyzed with SPSS 22 software and the PEBU and control groups were compared using the paired or unpaired t-test. The univariate and multi variate regression analyses was used for study variables. From January 2015 until January 2018, 3854 EVL procedures were performed and 141 of the patients presented with PEBU (hematemesis or melena; Table 2). The mean age of the PEBU population was 46.1 years, and the majority were men (91%). Most of the patients with PEBU presented within 10 to 13 days after the EVL (range, 3–21 d). Fifty-four patients underwent HVPG, with a median measurement of 18 mmHg. TIPS was performed in 19 patients, and the median number of applied bands was 3.5 (range, 2.75–5.0). Forty-nine patients showed alterations of the mucosa in the lower esophagus, specifically either neovascularization or scarring, or both. Eighty-eight patients had esophageal mucosa that appeared normal, with either esophageal varices or post-EVL ulcers. Eleven patients who presented with bleeding showed portal vein thrombosis on imaging. The control group had undergone EVL for indications similar to the case group (either primary or secondary depending on the departmental policy), and none of them experienced post-EVL bleeding. The PEBUs were classified as described in the Methods (Table 1). Of the 141 patients with PEBU, 23 had more than one type, specifically six with types A and B, 12 with types B and C, and five with types C and D.
Over the follow-up of 6 weeks, among the patients with PEBUs who suffered mortality, the PEBU types A-D accounted for 18 (39.1%), 14 (30.4%), 10 (21.7%), and 4 (8.8%), respectively. Seven patients in the control group died due to reasons unrelated to the bleeding (3 and 2 developed spontaneous bacterial peritonitis and pneumonia, respectively, and one patient each experienced intra cranial bleed and acute kidney injury). The mortality rate of the control group (7 patients) was significantly less than that of the PEBU case group (46 patients). Of the deaths reported in the PEBU group, 32 patients died within five days of bleeding and the remaining 14 died over the next 6-week period. Out of total deaths eight died after the TIPS procedure, all within five days of the bleed; 9 patients survived after TIPS. Two patients with portal vein thrombosis died, one within five days and one within six weeks of bleeding. In the case group, deaths within five days were due to the following: worsening liver failure (with elevated MELD-Na and CTP score); sepsis (blood culture positive in two patients); acute kidney injury, as per AKIN (acute kidney injury network) criteria; and pneumonia (new onset chest infiltrates on chest x-ray or chest computed tomography with productive sputum). Causes of death over the following 6-week period were related to sepsis (spontaneous bacterial peritonitis, pneumonia, blood culture positive) and organ failures (grade IV hepatic encephalopathy, and acute kidney injury). Factors in the univariate analysis included age, gender, day of bleeding after EVL, size of the varices, MELD-Na and CTP scores, endoscopy appearance of the esophageal mucosa, HVPG, TIPS, and number of bands applied (Table 3). On multivariate analysis, only the MELD-Na score and endoscopic appearance of the ulcer were significant, with ORs of 1.23 and 11.64 respectively (Table 4). The PEBU types A and B were most significant; the p values for the MELD-Na scores were 0.016 and 0.02, receptively, and the ORs 11.64 (CI 1.59–85) and 3.12 (0.5–17.6). total mortality was 46 patients. This retrospective study investigated associations between the endoscopic morphology of PEBUs and patient mortality. No correlation was found between the incidence of sepsis and bleeding. PEBUs were classified based on their endoscopic appearance in descending order A–D. Of 3854 EVL procedures, 3.6% patients developed PEBU, and of those 32.6% suffered mortality. Of those who died, for 76% death occurred within five days, and 39.1, 30.4, 21.7, and 8.8% had PEBU types A, B, C, and D, respectively. The MELD-Na score and PEBU type severity correlated positively with mortality. After adjusting for MELD-sodium score, mortality was best predicted by a type-A ulcer. Thus, stratifying patients based on PEBU type during the first five days after presentation can help predict mortality, independent of the MELD-sodium score, and can inform the treatment strategy. PEBU has been reported to occur in 3% to 9% of patients; Grothaus et al.4 and Cho et al.5 reported rates of 7. 8% and 7.7%, respectively. In the present study the incidence of PEBU was 3.6%. All the patients in the present study received prophylaxis with proton pump inhibitors and sucralfate syrup for at least 2 weeks.4,5,9,10 The use of sucralfate after EVL is a common practice. Sakr et al.11 demonstrated in a randomized controlled trial (RCT) that intake of sucralfate was associated with ulcers of smaller size and less risk of PEBU. There has been no further RCT that addressed the complications of sucralfate after EVL.12 In addition, a RCT by Shaheen et al.13 showed that, in patients who received proton pump inhibitors, 2 weeks after EVL the size of ulcers was smaller than that of patients who did not receive the drug.13–15 However, the overall complication rates and outcomes of the two groups were similar. Although RCTs have concluded that either sucralfate or proton pump inhibitors, when applied singly, may decrease post-EVL bleeding,7,12,14 there has been no study of their combined use to reduce the risk of post-EVL bleeding. Grothaus et al.4 reported that post-EVL bleeding was observed around the tenth day after EVL, and the rate was positively associated with the severity of liver disease (reflected by CTP score), lower albumin, and lower prothrombin activity. They also noted that bacterial infections and elevated heart rate were associated with post-EVL bleeding, but univariate or multivariate analyses of the present study determined that these variables were not significant. The first five days of PEBU is considered a crucial period for patients with severe liver disease, as uncontrolled bleeding may lead to further complications. The present study found that during these first five days, the classification of ulcers was predictive of the outcome. A study by Bambha et al.16 appears to concur, since it was reported that increased mortality (40%) occurred within the first five days of the presentation of bleed; in the present study, 76% of patients with PEBU who died did so within the first five days. The higher mortality in the present study could be related to the high MELD-Na score and therefore more severe liver disease of our patients. Although the patients in the present study were cared for in tertiary hospitals, many of those with PEBU types A and B did not survive. This indicates that changes in management strategy are required, with systemic therapies (TIPS and liver transplantation)17 in addition to local therapies such as stent, injections, and sprays. For type C and D ulcers, the less aggressive local therapies may be sufficient. Therefore, the ulcer morphological classification, in addition to MELD-Na score, should guide treatment in PEBU. The present results warrant further validation. In a small post mortem study, Polski et al.18 elegantly described the evolution of post-EVL changes in the morphology of esophageal varices. The present study found that, although ulcers began to develop four days after the EVL, most bleeding episodes were noted at days 10 to 13. This is probably due to neovascularization, and during this time the scab over the ulcer is weak before the ulcer heals completely. In some patients with poor liver functions (reflected by elevated MELD-Na and CTP scores), ulcers were found even in the fourth week after EVL. This could be attributable to elevated portal pressure and poor coagulation functions. Various management strategies for PEBU’s have been reported, such as Sengstaken-Blakemore tube placement, redeployment of EVL bands, sclerotherapy, glueinjections, SEMS, TIPS, and in some case reports, even liver transplantation.17,19–21 We found in the present retrospective study that PEBUs can be best managed according to the morphological classification of the ulcer, as the higher order types (A and B) were associated with highest mortality. 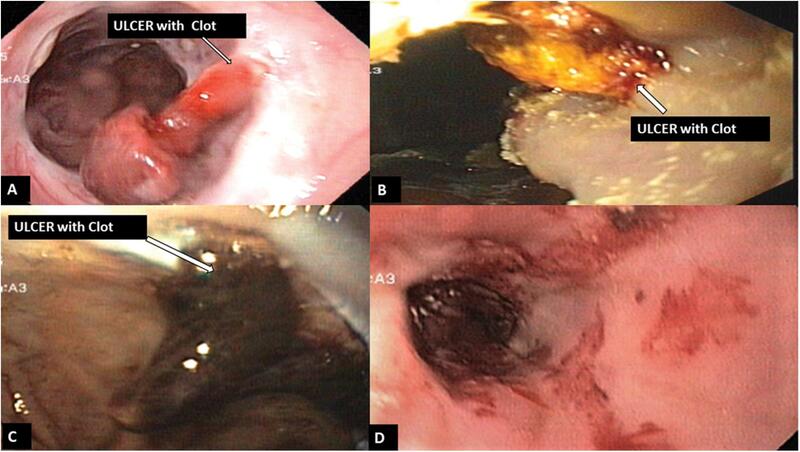 Thus, the treatment strategy can be decided on the endoscopic appearance of the ulcer. However, a prospective and multicentric study is needed to validate these data. Based on our experience we propose an algorithm for management of PEBU (Fig. 5), in which both the endoscopic appearance of the PEBU and the patient’s liver disease status should be considered. If the ulcer classification is high (either type A or B) and the liver disease severe (MELD-Na > 24 and CTP score > 8), then the chances are low that these patients will respond to conventional methods of treatment such as glue injection at the bleeding ulcer, repeat EVL, or deployment of a SEMS. The likelihood of response to conventional therapies will be higher if the patient has good liver functions, even when the ulcer classification is high. Fig. 5. Suggested algorithm for management of PEBU’s of different clinical status. In this cohort of post-EVL patients, the rate of PEBU presentation was 3.6%. Both the severity of liver disease (MELD-Na) and the morphological appearance of the ulcer were associated with patient’s outcome in both the short term (five days) and long term (six weeks). The morphological appearance of the PEBU determined the outcome in these patients, independent of MELD-Na score. Thus, independent of the MELD-Na score, the classification of PEBU based on endoscopic appearance can help identify patients who will require systemic therapies, in addition to standard care. Designed the study, created the management plan, and performed the follow-up (KDJ), contributed the clinical input, edited the manuscript, analyzed the data, and participated in the follow-up (MKS, RM, GK, SKS).